Snyder's of Hanover's pretzel-baking prowess dates to 1909. More than 100 years later, the company has charted a new course with the addition of gluten-free pretzel sticks to its assortment of snack foods. The pretzels, certified by the Gluten-Free Certification Organization (GFCO), will be on supermarket shelves nationwide in July. Having recently sampled the product, I can safely predict that it will be a success. Each stick is a bit over three inches long, dotted with salt crystals. The pretzels I tried varied slightly in thickness, but each bite brought a healthy crunch. The all-natural sticks are made primarily with a mix of corn, potato and tapioca starches, and are also free of dairy, casein and egg. For those who can't eat gluten, the natural comparison is to Glutino's pretzel sticks. Between the two, I give the nod to Snyder's. I found the Snyder's version airier and, well, more "pretzel-like" than Glutino's effort. In fact, as a gluten-eating consumer, I actually preferred the new gluten-free sticks to their wheat counterparts. Snyder's has the edge in the numbers game too. A single serving of 20 sticks is 120 calories, 1.5 grams of fat, and half a gram of saturated fat. A comparable serving of Glutino's pretzels is 140 calories, 6 grams of fat, and 2.5 grams of sat fat. The Snyder's sticks are less salty too, with 330 grams of sodium to Glutino's 420 grams. Glutino's pretzels are made in a dedicated gluten-free facility. 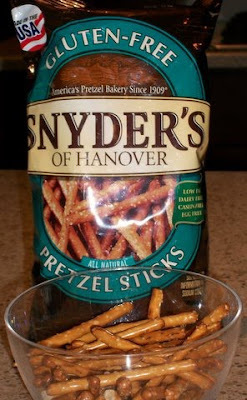 Snyder's equipment goes through a GFCO sterilization process before the pretzel sticks are produced to ensure they meet the GFCO standard of less than 10 parts per million of gluten. The new Snyder's pretzels will be sold in 8-ounce bags, labeled with the GFCO seal, for between $3 and $4. Whatever your pretzel preference, gluten-free consumers stand to gain from having more choices. Competition among companies inures to our benefit, fostering new and innovative products for the marketplace. DISCLOSURE: While Snyder’s of Hanover provided product samples for me to review upon my request at no cost, such compensation did not influence my review. Neither I am nor any immediate family member is an employee, officer, director or agent of Snyder’s of Hanover or its respective parent, subsidiary and affiliated entities, advertising and promotional agencies. My full Disclosure Policy can be found toward the bottom right of each page on Gluten Free Philly. Thanks for the update. I can't wait to try these pretzels. If they really are $3-4 per bag, this is cheaper than the Glutino pretzels. Do you know when they will hit the shelves? Thanks for the info! Personally, I love Glutino pretzels, but gotta say I love that the Snyder's are made here in the USA. And the more choices we have, the more gf and allergen-free will become less expensive and more mainstream to find! This is excellent news! I was born and raised in Hanover, PA (now living in Blue Bell) so I'm very familiar with Synder's. I'm happy to hear they will be manufacturing gluten-free pretzels! Thanks for sharing. Has anyone found this on shelves? South Jersey markets?